A Scott memorial obelisk in Norway. Episodes: 10 & 32. Site Number: 038. Date Posted: 1 June 1996. Location: Finse, Norway. Type: Memorial. 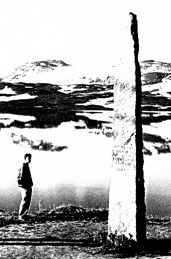 A letter appeared in the April 28, 1966 issue of Country Life that, in part, read: "Close to the station, on the shore of Lake Finse, there is a little-known monument to Scott, which takes the form of a rough-hewn granite obelisk. This was raised to commemorate his connection with the locality--for it was at Finse, on the Oslo-Bergen [railroad] line, that the heroic explorer and his companions trained and prepared themselves prior to their thrust into the great white continent." The district was apparently a popular testing ground for polar explorers for it was also here that Shackleton tested his air-propelled sledge and motor crawler in May of 1914. He also "put the new round tents to a severe test. . ." (The Fishers, Shackleton, page 317). Arne Storhaug, manager of the hotel at Finse, reports that the inscription on the five meter high obelisk reads: "Reist av nordmend 1914 til ære for arktisk forskerånd og heltemot" [in English: Erected by Norwegians in 1914 in honour of the spirit of the polar research and of great heroism.] The names of the polar party--Scott, Wilson, Oates, Bowers and Evans--apparently also appear on the obelisk, which is in good condition and stands in front of the the hotel entrance. A history of the hotel at Finse is now being prepared by Finn R. Jørstad of Bergen. He recently wrote me with some very interesting information, which I include below, edited somewhat. Robert Scott was never at Finse. His polar preparations in Norway took place at Fefor, a hotel in Eastern Norway (see Roland Huntford Scott & Amundsen, Reginald Pound Scott of the Antarctic and Tryggve Gran The Norwegian with Scott). So why the obelisk at Finse? I found the answer in newspaper reports from the unveiling of the monument (December 28, 1914). The initiative for the monument was taken by a newspaper in the small town of Haugesund. The Bergen Aftenblads (Bergen Evening Post) reported the vice-chairman of the Norwegian Geographic Society, Prof Skattum, said in his speech at the unveiling: "We erect this monument here at Finse, as this is the center of Norwegian winter sports..."
Shackleton's stay at Finse in May 1914 is confirmed by many reports in Norwegian newspapers, all describing his camping on the glacier. As for other Finse Antarctic connections, I can only inform you that Tryggve Gran was a "regular" at the hotel, right up to the 1930s...and that Lieutenant Campbell, who took part in Scott's last expedition, visited Finse as a tourist in May 1914 and later in the 1930s. I have not found anything that proves that Roald Amundsen stayed at Finse. At any rate, as far as I understand Amundsen and his training methods, he would never have stayed in a cozy and luxurious hotel! I may add that part of the British film, "Scott of the Antarctic" (John Mills as Scott), was shot at Finse and the installment in the BBC series "The Great Explorers" describing Amundsen's discovery of the South Pole likewise was filmed at Finse (1974). My thanks to Mr Jørstad for clarifying the Finse-Scott connection.